Take a dip for a good cause. A plunger lends some mojo to the 2014 Santa Cruz Polar Plunge, which benefited Special Olympics Northern California. The 2015 plunge is on Saturday, Feb. 28. EVERYBODY PLUNGE: If we were a beach -- not a big one, and not an especially popular one, mind you, but just any ol' sandy shore along the ocean or a big lake -- we might get a mite jealous if humans did not organize an annual Polar Plunge at our waterfront, each and every year. What's the reason for our envy? Just that so many of our fellow beaches, from Huntington Beach all the way up to Humboldt Bay and over to Lake Tahoe, do the whole "everybody take most everything off and run into the chilly water to raise money for charity!" It's a good plan, a funny one, one that gets a lot of play on social media (meaning more money is raised, fingers crossed), and people bound to a workaday world like getting rather silly come Saturday. Nope, Polar Plunges aren't just for New Year's Day nowadays, though, worldwide, that's the date they're most often attached to, but they show up throughout the wintertime at various spots. The next spot to host one? Santa Cruz, right near the boardwalk, and this go-around is more about gussying-up (rather than showing some skin). 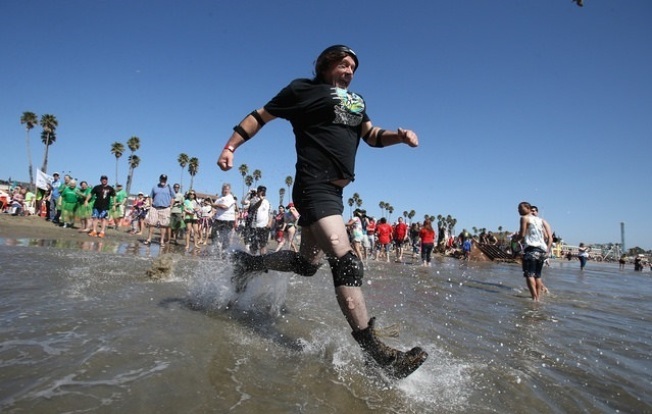 Participants are invited to wear a costume as they dash into the not-too-chilly ocean. OKAY, SATURDAY, FEB. 28... will be plenty cold in the Pacific, though given the fact that spring is on the horizon, the goosebumps should dissipate pretty darn quickly. The funds raised from the day "benefit the more than 19,960 Special Olympics athletes in Northern California & Nevada!" And you don't have to Plunge to raise funds -- even a toe dip is cool, or staying out all together (yep, you're designated a "Chicken," but you'll just have to run with that adorable label and wear some feathers as you stand on the beach). Even if you don't take part, it'll be a pretty memorable sight, full of costumes, if you like the color of the boardwalk and outlandish revelers and the ocean. And we all do. IS HOT STEAMY LIQUID... more your thing? The boardwalks hosts its annual chowder showdown the Saturday before the Polar Plunge, on Feb. 21. Better chowder-up if you're going to do the sand-to-water dash the following week.